Been on the road for the last week, and couldn't have timed it any better as the Sox have gone Triple-A on us, and hung it up for 2010. I've been up in the Great White North (Canada, for those of you who skipped geography class). And because my only communication device is a Zack Morris edition cell phone, and thankfully Canadian hotel TV doesn't exactly highlight basebally activities, I came home Saturday only to find out the Sox had gone on a September bender and had laughably fallen 10 back. However, all was not lost. I did manage to sneak into the Skydome/ Insert Random Canadian Sponsor Stadium, and messed with all the Blue Jays stuff just so the Sox don't have to worry about falling into 4th place before the season is done (which may still happen). The view from the "expensive" seats. In Toronto terms, that's $45. At Fenway that would get you napkin. Ok, half a napkin. Don and Jerry's seats in the Skydome. I only know this because Rem-Dawg's gang tag was carved into the desk. The media booth. I believe this is Dan Shaugnessy's phone. I blew snots all over it. Little known fact: all of the infield seats at the Skydome rotate on cast iron wheels to convert the field for football. That's right, if someone where so motivated, you could hijack the seats at the Skydome. I'm drawing up plans as we speak. The Blue Jay will never mess with me again. I honked his nose. Me managing the Red Sox. As you can see there's nobody on the field because everybody is on the DL. Me pretending to be a professional baseball player robbing Marco Scutaro of a double. Ha, I'm kidding myself... Marco could never hit one that far. The impressive Vernon Wells view. 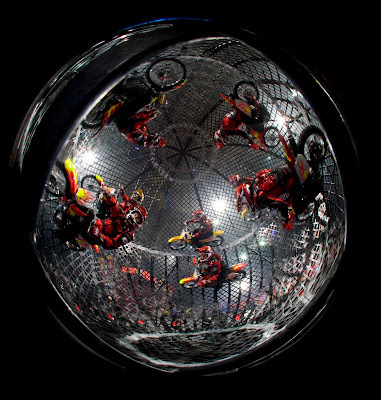 With the dome closed, it almost feels like being in the Barnum & Bailey's Motorcycle Cage of Death. The view from the CN Tower. Still can't figure out how the roof works. So I squished it with my fingers. Stopped by Montreal for an Expos game. As you can see, it was a sellout crowd.